What was the inspiration for Belle & Boo? Whilst I was at university in Leeds, I spent some time in Paris on a university exchange. The Parisian children had such an elegant, old fashioned charm, wearing classic clothes and hair styles; one day I was in a park and heard a mother calling her little girl – Belle. It was such a lovely name, and so I began drawing a little girl named Belle; as I drew, I felt she needed a companion and drew a curious bunny. Boo seemed the perfect name for Belle’s companion and Belle & Boo just looked harmonious when written together. 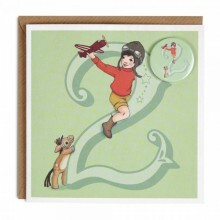 In 2007 I began selling my illustrations on craft website Etsy.com, and Belle & Boo was born. Why is it important for children to be surrounded by beautiful art and design? From a very young age, I enjoyed beautiful pictures and objects. I had a beautiful German vintage Hansel and Gretel wooden mural above my cot, and my boys now have it in their room. My favourite books from my childhood are still my favourites today, The Water Babies illustrated by Mabel Lucie Atwell and the Milly Molly Mandy series – the map at the beginning of that series is etched into my brain. Small children know good design when they experience it, and it’s wonderful that parents appreciate that quieter, more considered objects will sometimes remain with a person for a life time. How did you balance parenthood and setting up your business? 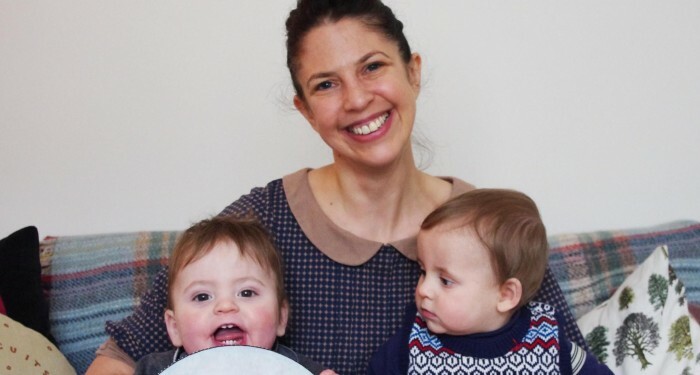 It worked out well in that my business partner, Kate, had her two girls first, then I had my twin boys, so we were both there for each other when it was most tricky. I have a wonderful nanny and the twins father is very hands on. 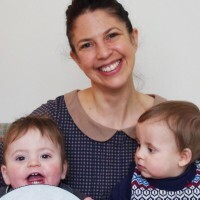 Sometimes I have the classic feeling I’m not doing a very good job of either role, but mostly I think how lucky I am to do a job that I love and be a mum. Belle & Boo also have a team of wonderful people, so these days I can just concentrate on new art work – long gone are the days of queuing at the post office. 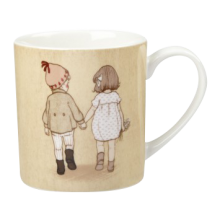 Do you work with other artists on Belle & Boo? 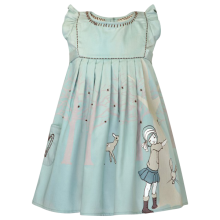 I do all the art work myself, but I have created a collection of girls clothing with a UK-based designer, and before that I worked with Australian designer Tea Pony on two sweet Belle & Boo dresses. I also need to talk through my ideas – sometimes the smallest comment can lead to the biggest and best ideas. I regularly try and meet with creative friends, and my partner Russ is creative, which helps us both hugely. He understands that sometimes you can’t just finish work at 6 o’ clock, or that the plans you made for the weekend have to be cancelled at the last minute. We are a true collaboration ! What is the idea behind the Boo-tique on your website? I launched my career making and drawing from my home, so I have an appreciation for exceptional craftsmanship. I am always on the hunt for hidden gems and it is always exciting to discover wonderfully crafted pieces by talented designers. The Boo-tique gives me the opportunity to share my finds and raise awareness of these designers. Each designer or artist is invited to create something unique, which is showcased in the Boo-tique. When a piece is purchased, it is presented with the designer’s own label, and a note with the words “We found this together, love Mandy”. For the home, pieces include Adelaide Wood’s vintage-style hand knitted and crocheted cushion covers and some stunning restored and hand painted children’s furniture from Kate Penrose. Smaller gifts include a collection of exquisite silver jewellery by Sarah Hartley, who has put a contemporary twist on the charm bracelet with Belle & Boo characters to add and collect. New designers will be added over time, all with beautiful, unique pieces which sit perfectly alongside Belle & Boo’s own range of collectable gifts and homewares. 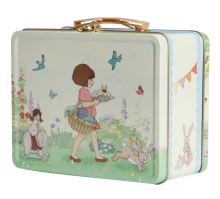 What are your personal favourites from the current Belle & Boo collection? 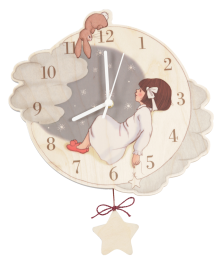 Our new wooden Catch A Star clock has a magical Peter Pan feel to it, while the Together mug (in the adult size) is my ideal morning coffee mug (I really like that illustration). 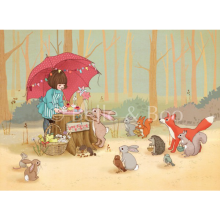 I love the ‘Play Shop’ art print – it was a lovely illustration to work on and has influenced the direction for the illustrations in our new Belle & Boo book. Our new numbered birthday cards produced by 1973 are great, and I am also really happy with our 2014 Advent Calendar craft kit in aid of Kids Company. It looks stunning, with all the different Belle & Boo images, so I am very happy we can raise money for Kids Company as well as offer an alternative to the mass produced advent calendars on the market. What surprises can we look forward to from Belle & Boo in 2015? 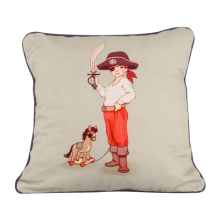 We have a bedlinen range as well as a new picture book that will have a whole new look and feel to the current collection. What motto do you live by? It all works out in the end! Whether it’s Christmas or a birthday, what are your favourite ideas for creating a memorable celebration for children? Make sure you have all the people there that your children love, then take lots of photographs – children love to look back at photos of themselves and their friends and families. Have as many balloons as possible, there can never be too many balloons! You can also see Mandy’s inspiring suggestions for making magical family memories in our Magical Christmas feature next week.